An old video of an unrelated protest is shared to claim police used brutal force against Ayyappa devotees at the Sabarimala shrine. A Facebook page called ‘Nachiyar 2.0’ shared a June 2017 video of police accosting protesters opposing the construction of an LPG terminal at Puthuvype in Kochi to falsely claim Kerala police lathi charged Ayyappa devotees at the Sabarimala shrine. The shrine has been rocked by protests ever since the Supreme Court’s landmark judgment on September 28, 2018 that permitted women across all ages to enter, breaking an age old tradition. Earlier only men and pre-menstruation and post-menopausal females were allowed inside, restricting entry to women during their menstruating age. However, conservative devotees backed by the Rashtriya Swayamsevak Sangh and the Bharatiya Janata Party, who feel the court has no place deciding on religious customs, have prevented the entry of women who have tried to enter the shrine. The video posted earlier this week has been shared over 8,000 times since it was uploaded on Wednesday. 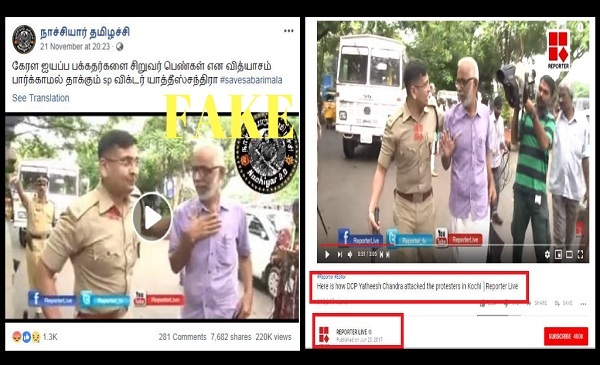 The text in Tamil accompanying the post also puts a malicious communal spin by giving a Christian name ‘Victor’ to Kerala Superintendent of Police, Yatish Chandra. The caption translates to, “SP Victor Yatishchandra is attacking Ayyappa devotees, not even sparing women and children”. The clip bears the logo of local news website Reporter Live. Click here to view an archived version of the Facebook post. However, the same video was uploaded to YouTube on June, 20 2017. The video is from June 2017 when Kerala police led by then Deputy Commissioner of Police of Kochi City, Yatish Chandra used force to disperse protesters that included the elderly and children opposed to the construction of an LPG terminal at Indian Oil Corporation (IOC) plant at Puthuvype in Kochi. Residents are opposed to the project fearing it poses potential environmental and safety hazards. ‘The police team led by Yatish Chandra had resorted to lathicharge on two occasions- once on June 16, 2017 when residents had gathered in front of the Kerala High Court and the next day when they tried to enter the IOC plant,’ The News Minute had reported. Video footage of the lathi charge drew widespread anger in Kerala at the time and was condemned by the media and human rights activists, alike. Yatish Chandra was even pulled up by the state’s human rights commission to provide an explanation for using excessive force. An IPS officer, Chandra is the chief of police of Thrissur district and is in charge of Sabarimala’s Nilakkal region, which has become the base camp for the hill shrine. The misleading Facebook post was uploaded on the same day Chandra got embroiled in a controversy for allegedly being out of line with the Union minister of State for Finance and Shipping from Tamil Nadu, Pon Radhakrishnan. The minister on Wednesday wanted to enter the temple but was stopped by the officer. A video of a confrontation between the two has since gone viral.